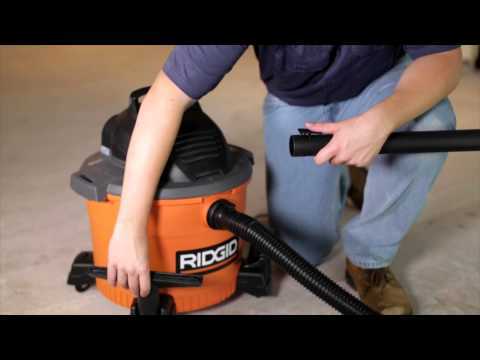 The RIDGID® 9 Gallon High Performance Wet/Dry Vac is designed for those who want a traditionally styled, compact vac that delivers the powerful performance and rugged durability required for job site clean-up. This vacuum’s 9 gallon drum size results in a more compact design that requires less storage space on a service truck or in a work shop or garage. And its top carry handle makes transporting easier than ever. It features the Patented Qwik Lock™ Filter Fastening System that makes installing or removing your filter quick, easy & secure. 9 Gallon Wet/Dry Vac is rated 4.3 out of 5 by 422. Rated 5 out of 5 by pj2019 from great performance for the price. Bought this vac for a car project I'm working on. Lots of rust and debris to be picked up prior to painting. Worked perfectly for the job ! will find many uses around garage and home. Rated 5 out of 5 by Baweb from Very Satisfied I purchased the 6gal unit but realized it wasn't big enough for my use. The 9gal is perfect. The large hose, basin design and motor size all make the unit very powerful. I would like to see more accessories included with the pkg tho. Rated 4 out of 5 by SteelyDan from so far so good recently purchased the vacuum. so far so good. I guess the only question I have is why does the vacuum NOT come with a vacuum bag as part of the initial purchase? You have to spend an added 15.00 for bags. Rated 2 out of 5 by Wa2kop from Not as versatile as I thought, might be returning it. Mfg failed to include a brush attachment which I find just as useful as the floor attachment, adding additional item cost Also, no 1 7/8 to 2 1/2" hose adapters available. My previous (6 gal Shop) vac had a 2 1/2" Hose opening which provided more options. Rated 5 out of 5 by Gojo from This product is a workhorse and it comes with attachments and an extra long hose. This shop vac is raplacing another Rigid that passed away after 12 years of service. This new one works better. Rated 5 out of 5 by Sandra from This Product has Enough Power to Do the Work I Purchased this Product by Word Of Mouth From a Friends Recommendation.I Overly Shampooed My Cars Carpet And Felt I needed More Than,a Bunch Of Towels To Absorbs the Over Soaked Carpets.This Wet Dry Vacuum was Just What I Needed Especially,for the Price.This Vaccum Saved The Day. what is recommended to attach a hose or pipe for drainage with my Rigid 9 gal wet/dry vac ? Or what size adaptor ? Where can I get an adapter that fits the 1 7/8&quot; hose? I want to attach the unit to an outlet port from a tool. Ridgid does not sell an adapter for 1 7/8&quot; hose. Their alternative is to buy another hose that is 2&quot;.